Squier really does put the effort into delivering a true-to-the time, 1950s look and feel with the Classic Vibe ’50s Telecaster. The brand has delivered a model with the timeless single-cutaway shape, with several appointments that boost this guitar’s fifties nostalgia factor. 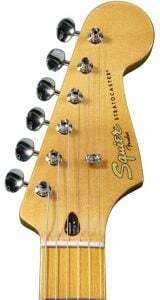 For example, you’ll find a vintage-tinted gloss finish on the maple neck, which sports a modern C shape, giving the best of both worlds in terms of performance and aesthetics. This neck features a maple fretboard with 21 medium jumbo frets and is fun to play with a smooth feel in the hands. The body is also very retro in its style with two gorgeous paintjobs to choose from – the popular Butterscotch Blonde as well as a lighter Vintage Blonde. This still allows the tight grain of the solid pine to shine through, leading to a lovely-looking instrument which feels very much like a higher-priced guitar in its performance. Don’t forget the black pickguard and the iconic Telecaster headstock with gold Squier logo to complete the lineup. The components of the Classic Vibe ’50s Telecaster enhance the look as well as the tone and playability. Starting with the electronics, there are two custom vintage-style single-coil Telecaster pickups with Alnico III magnets. These are tended to by a three-way switching system, along with controls for master volume and master tone. Simple, but effective. Fixed to the bottom of this model is a vintage-style Telecaster bridge which sticks with tradition by both stringing through the body and offering three brass barrel saddles in the ‘ashtray’, instead of the modern-day six. 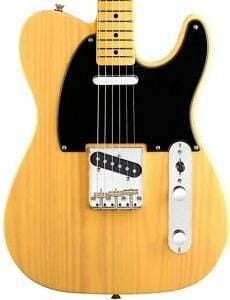 Perhaps these lack the easy adjustability of their modern counterparts, but they will certainly please purists who crave the genuine Tele tone. At the other end, this Tele is fitted with pretty standard vintage-style chrome tuners and a synthetic bone nut. The build, the vintage bridge, and the single-coils in the classic Tele configuration all combine to deliver the retro tone Tele enthusiasts want – full of warmth and twang, which is great for blues, jazz and country. However, the use of Alnico III magnets in the single-coils increase the versatility, by offering a slightly hotter output than expected, which makes this Tele a perfect candidate for classic rock in addition to the lighter stuff. 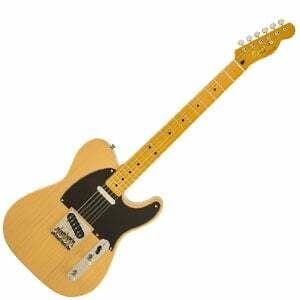 There’s little wonder why the Classic Vibe ’50s Telecaster is so popular with all kinds of guitarist. Beginners will appreciate its simplicity and price, while experienced players will love the tone and style. For under $500, this is worth adding to your collection if you’re looking for a go-to guitar for all things vintage. For more info about the Squier Classic Vibe 50’s Telecaster, click here. For more electric guitars less then 500$, click here. I have a vintage 52 RI and bought the classic vibe. Can’t find much difference between the 2. I should mention the neck maybe, it’s the most notorious aspect. The baseball bat neck on the RI is nice, but… the neck on the CV is sooo comfortable and I just love it.